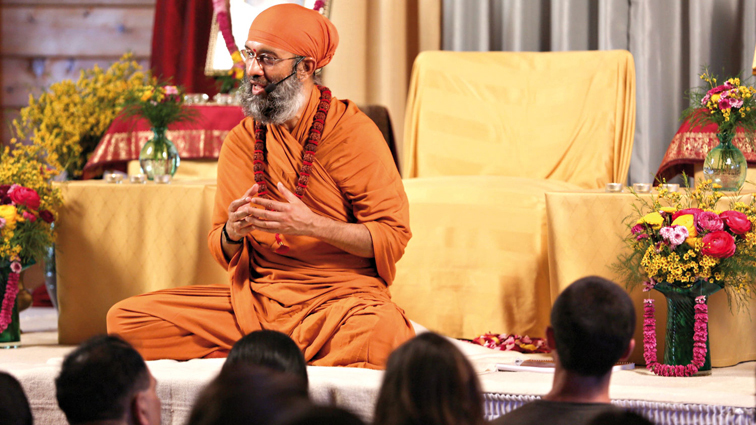 Our spiritual philosophy curriculum (gurukulam) is known by the Sanskrit name Hansadarshin. This curriculum is placed second out of seven levels of the Teachings tab. These wisdom teachings and their conceptual framework are readily disseminated through our public fellowships and annual retreats attended by hundreds of seekers and devotees. These fellowship-based teachings and adhering affirmations purify the mind when practised, and allow the seeker to grasp the subtler concepts and develop a vision of a spiritual life. Sanskrit is well known as a root language and for its vast literature. However, the depth of spiritual philosophy contained in its ancient literature is not adequately represented in English or other modern languages. It is a great revelation for a seeker to comprehend how faith and evolution are effortlessly interwoven in the Sanskrit texts whenever they pertain to a deeper philosophical inquiry. It is no less of a discovery to see first-hand how ancient Sanskrit philosophies live on as a universal heritage for humankind, especially as a bridge between science and spirituality. This indigenous knowledge including its esoteric meditation practices rest upon learning under the guidance of adepts whose lineages can be traced back to Vedic antiquity. The monastic tradition of monks who guide the teachings of this curriculum is based on an inquiry that combines advanced meditation with erudite scholarship using the aphorisms (sutrāṇi) of ancient cardinal philosophical treatises. Reflection on philosophical tenets and rational analysis are used as part of rigorous training to unfold firm conviction. Arduous meditation is pursued to bring about the understanding of underlying principles. This results in the incontrovertible perception of truth with regard to immutable consciousness, mutable matter and the ‘willpower’ behind creation. Only then the Hansadarshin curriculum is taught and shared with seekers or interested public audiences through loving articulation. The Sanskrit verses and aphorisms selected as the tenets of wisdom are primarily from the cardinal texts of Sāṅkhya, Yoga and Vedānta philosophies. An explanation is provided as to why they are deemed as statements of truth and how they are relevant now. The original revelation of Sanskrit scriptures is expounded upon with some attendant inquiries: Who is foremost among the teachers? Is the original revealer of wisdom teachings limited by time? How are these teachings passed down? Who are the seers or sages who share their profound realization through these cardinal philosophies? How does the exegesis by meditation adepts help us here and now in these modern times? Here are some other profound inquiries that this Hansadarshin curriculum addresses: What are the primordial causes of creation, if any? Are the seer and the seen distinctly different? Can the knower ever be a knowable? What is consciousness? Are there many conscious entities? Is all matter linked? What part of us is evolving? Is our self-awareness eternal? Have we always been around? What is ego? Who is Ishwara (best English translation is God)? Are there many overlords for multiple universes? Is cultivation of faith connected with overlapping minds? What is sentience? What are the sentient, mutable and conservative principles palpable in evolving matter? Are cognition, mutation and inertness connected with these principles? Where are latent impressions stored? Can matter evolve out of consciousness? Is there unmanifest matter? If so, how does it start evolving through mutation? What is the relationship between mutable matter and unmanifest matter? Does the evolution or mutation entail discrete steps? Sargeant, Winthrop. Shri Bhagavad Gita. New York: SUNY Press, 1993. Easwaran, Ecknath. The Bhagavad Gita. 2nd ed. California: Nilgiri Press, 2007. Raju, Poola Tirupati. The Philosophical Traditions of India. 2nd ed. New Delhi: Motilal Banarsidass, 2009. Sastri, Alladi Mahadeva. The Bhagavad Gita. Chennai: Samata Books, 1897. Winternitz, M. A History of Indian Literature. 1. Calcutta: The Calcutta University Press, 1927. The new moon that marks Dipāvali is a festive observance celebrated by the lighting of lamps.